I have a lot of outside fun planned for my last couple days of art class but mother nature has been teasing us with a chance of rain almost every day. This means that I had to come up with a back-up lesson. 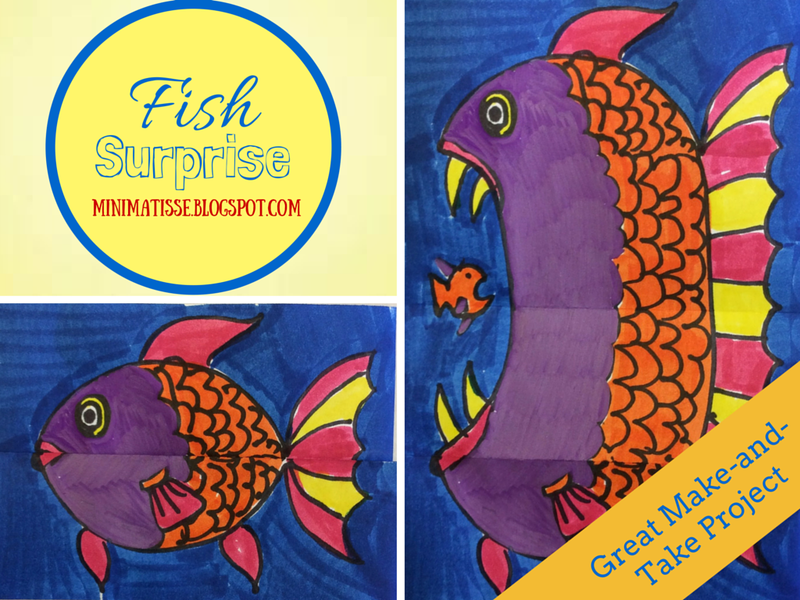 Thanks to my amazing online tribe (via Facebook, Blogs, and Twitter) I have a plan... a Fish Surprise. This clever drawing is magic for all age levels and it's a great make-and-take in one hour. Ways to challenge your students after trying a fish might be to give them the following challenges or prompts. Can you make your fish doing something other than eating something else? Can you use this idea of expanding in a different way? A different animal or object? What other mediums could you use for this? Could you make any of this project 3-D or pop up? Could you make a series or book with this idea? First-grade example of this lesson in one hour. Always welcome to do so. I used you sub lesson blog often. Thanks for creating it! Perfect! Thanks for the video. What a great resource! Thanks Jan! I your blog is such an amazing resource! !